John Hedley Wright Yerbury was born in Frome in 1897. He was the only child of boarding house keeper Alban Yerbury (1867-1942) and Mary Ellen née Wright (1869-1949). It would appear that John spent the whole of his life in Frome except, perhaps, for a year or two when he worked at Parr's Bank, Yeovil, prior to enlisting. John enlisted at Yeovil in 1915 as a Private in the 4th (Queen's Own) Hussars. His Service Number was 18161. The 4th (Queen's Own) Hussars was based in Dublin at the commencement of the Great War and landed in France as part of 3rd Cavalry Brigade, 2nd Cavalry Division, in August 1914 for service on the Western Front. The regiment took part in the Great Retreat in September 1914, the First Battle of Ypres in October 1914 and the Second Battle of Ypres in April 1915 - all before John joined them at the Front. The 4th (Queen's Own) Hussars remained on the Western Front throughout the war. 1916 saw no notable actions, but in 1917 the 2nd Division saw action in the Arras Offensive, a major British offensive during the First World War. From 9 April to 16 May 1917, troops from the four corners of the British Empire attacked trenches held by the army of Imperial Germany to the east of the French city of Arras. The first major action the 2nd Division was involved in was the First Battle of the Scarpe, from 9 to 11 April 1917. Zero-Hour for the First Battle of the Scarpe had originally been planned for the morning of 8 April (Easter Sunday) but it was postponed 24 hours at the request of the French, despite reasonably good weather in the assault sector. Zero-Day was rescheduled for 9 April with Zero-Hour at 05:30. The assault was preceded by a hurricane bombardment lasting five minutes, following a relatively quiet night. When the time came, it was snowing heavily; Allied troops advancing across no man's land were hindered by large drifts. It was still dark and visibility on the battlefield was very poor. A westerly wind was at the Allied soldiers' backs blowing "a squall of sleet and snow into the faces of the Germans". The combination of the unusual bombardment and poor visibility meant many German troops were caught unawares and taken prisoner, still half-dressed, clambering out of the deep dug-outs of the first two lines of trenches. Others were captured without their boots, trying to escape but stuck in the knee-deep mud of the communication trenches. Most of the British objectives had been achieved by the evening of 10 April though the Germans were still in control of large sections of the trenches between Wancourt and Feuchy. When major actions were not being fought, the 2nd Cavalry Division formed a dismounted unit and served in the trenches as a regiment under the command of the brigadier. The next major action in which John Yerbury would have taken part was the Battle of Cambrai. The Battle of Cambrai (20 November – 7 December 1917) was a British campaign of the latter stages of the Great War. Cambrai, in Nord-Pas-de-Calais, was a key supply point for part of the German Hindenburg Line. The British operation was to include an experimental artillery action and the commander of the British Third Army decided to incorporate British tanks into the attack. The battle is often erroneously noted for being the first mass use of tanks in a combined arms operation. However, the French had deployed large numbers of tanks in April (130+), May (48) and October (92) 1917 and the British more than 200 in Flanders in June and July. Sir Douglas Haig described the object of the Cambrai Operations as the gaining of a 'local success by a sudden attack at a point where the enemy did not expect it' and to some extent they succeeded. The proposed method of assault was new, with no preliminary artillery bombardment. Instead, tanks would be used to break through the German wire, with the infantry following under the cover of smoke barrages. The attack began early in the morning of 20 November 1917 and initial advances were remarkable. However, by 22 November, a halt was called for rest and reorganisation, allowing the Germans to reinforce. From 23 to 28 November, the fighting was concentrated almost entirely around Bourlon Wood and by 29 November, it was clear that the Germans were ready for a major counter attack. During the fierce fighting of the next five days, much of the ground gained in the initial days of the attack was lost. For the Allies, the results of the battle were ultimately disappointing but valuable lessons were learnt about new strategies and tactical approaches to fighting. The Germans had also discovered that their fixed lines of defence, no matter how well prepared, were vulnerable. Later, the 2nd Cavalry Division were involved in the the Capture of Bourlon Wood (24 to 28 November 1917) and the German Counter-Attack of 30 November to 3 December 1917. 1918 saw the return of the war of movement and the 2nd Cavalry Division took part in the First Battle of the Somme, notably the Battle of St Quentin. John Yerbury died of his wounds sustained in the Battle of St Quentin on 23 March 1918. He was just 21 years old. 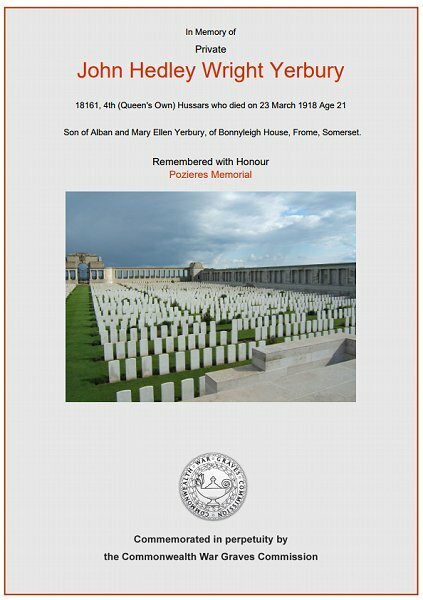 In its edition of 22 April 1918 the Yeovil Leader reported "Private F Yerbury, son of Mr A Yerbury, of Frome, who joined up three years ago from Parr’s Bank, Yeovil, has died of wounds in France on March 23rd." John is commemorated on Panel 3 of the Pozieres Memorial, Somme,France, and his name is inscribed on the War Memorial in the Borough. The Commonwealth War Graves Commission certificate in memory of John Yerbury.